The Supermicro MicroCloud modular server system provides the high density, performance, efficiency and cost savings required for today’s demanding server deployments. The 12/8 modular server nodes are conveniently integrated into a compact 3U chassis, saving over 60% of rack space when compared to traditional 1U servers optimized for the best performance per rack. 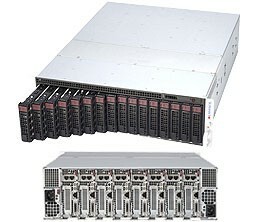 The Supermicro 5038ML-H24TRF SuperServer is a 24 node, MicroCloud server system comprised of the SC939HD-R2K02B 3U chassis and 12 X10SLE-DF motherboards. The SuperServer 5038ML-H12TRF is a 12 node, MicroCloud server system comprised of the SC939H-R1K63BP 3U chassis and 12 X10SLE-F motherboards. 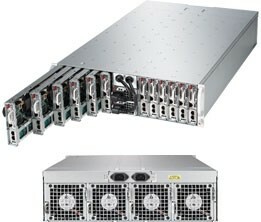 The Supermicro 5038ML-H8TRF is a 3U Microcloud Server with 8-Nodes, Redundant Power Supply, and 16x 3.5" Hot-swap Bays. The SuperServer 5037MC-H12TRF is a 12-node, MicroCloud server system based on the SC939H-R1K63B 3U chassis and 12 X9SCE-F motherboards. The Supermicro 5038MR-H8TRF is a 3U Microcloud Server with 8-Nodes, Redundant Power Supply, and 16x 3.5" Hot-swap Bays. 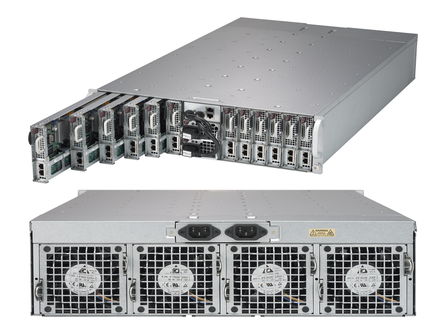 The Supermicro 5039MS-H8TRF is a 3U Microcloud SuperServer with 8 System Nodes, 16 3.5" Hot-swap drive bays, and 1600W Redundant Power Supplies. 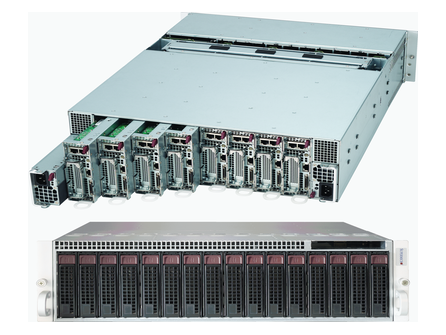 The Supermicro 5039MS-H12TRF is a 3U Microcloud SuperServer with up to 12 System Nodes, 24 3.5" Hot-swap drive bays, and 2000W Redundant Power Supplies.